I went to Germany to hike for 4 days when I had a long weekend off of my work. I went near the river Rhine because I saw the greatest pics and read about it! 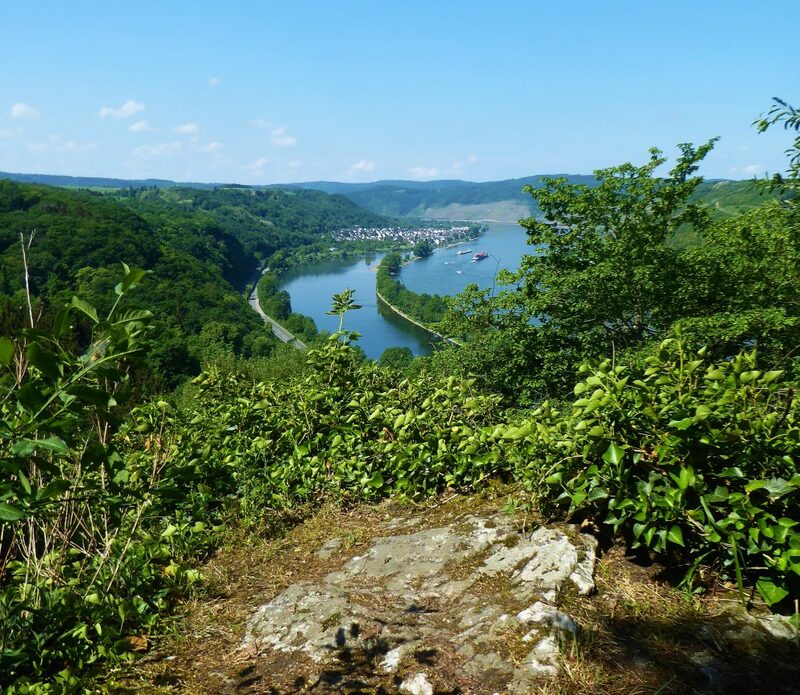 I wanted to be there too and so I went to hike a couple of stages of the Rheinsteig. 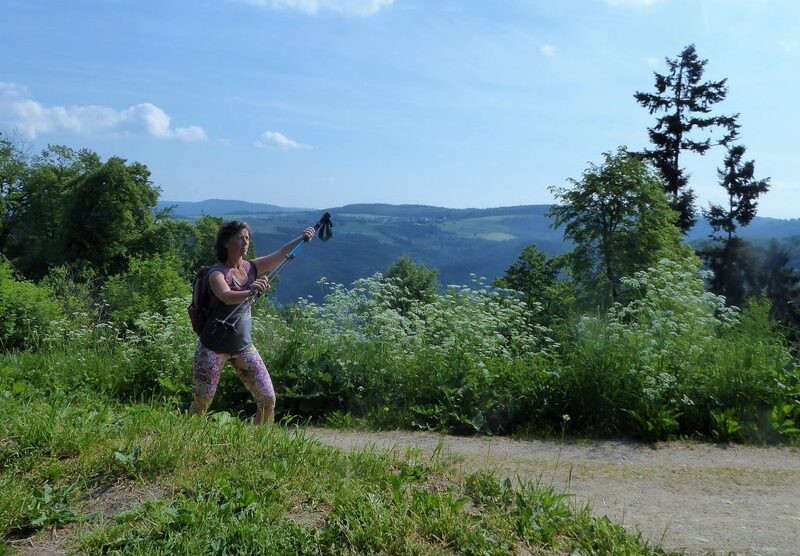 I had some troubles with my anckle and hip, both on the same side so I decided to take my new trekkingpoles with me. In 2016 I hiked with similar poles for 35 days and I really liked that! Now I went for some longer distances and with uneven grounds to walk on so it seemed like a good plan to use them again. I drove just passed Bonn and hiked 12K back to the city of Bonn that first day. To get back at my camper I used the train. It was a hike just along the water side, it was a good start but not the kind of hike I was looking for. I went down to Koblenz and parked my camper in the great village of Braubach. I hiked two days from there and it was just the best. Look at those great views!! 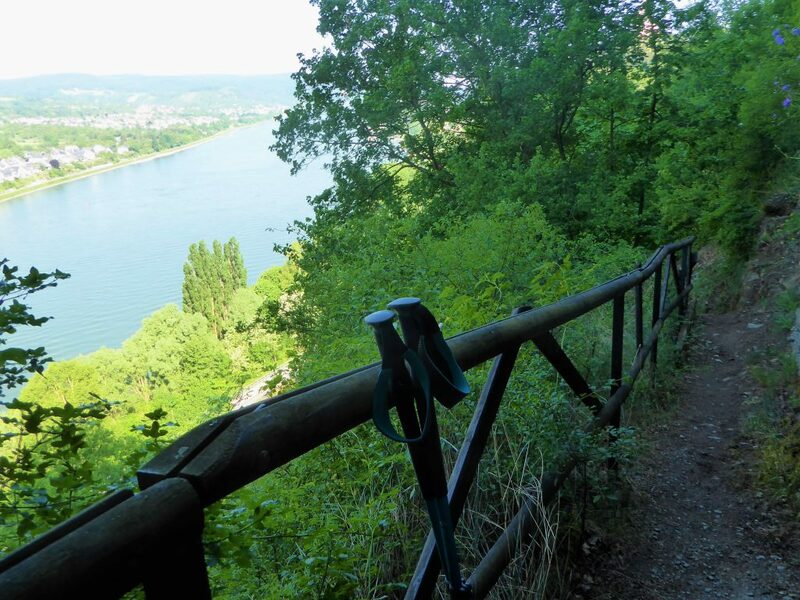 The great views you’ll get on the river Rhine when you go hike the Rheinsteig. 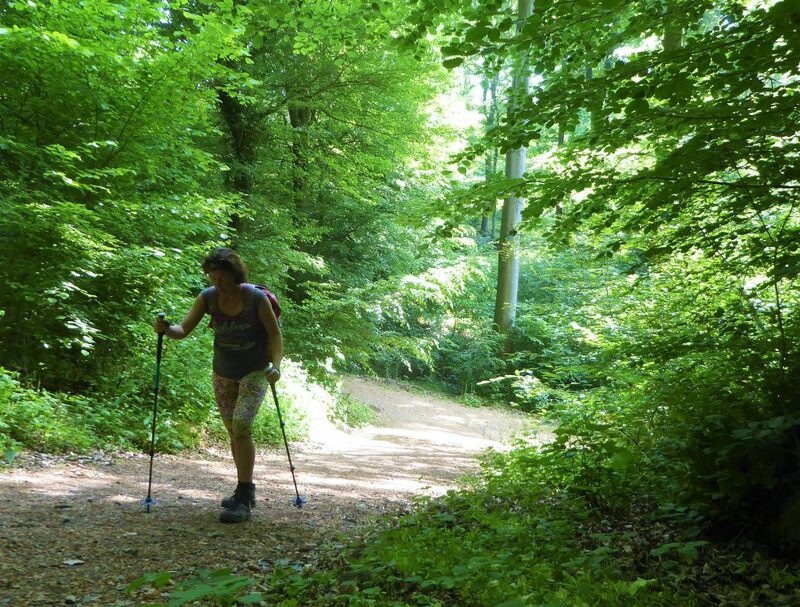 But what are the benefits of the trekkingpoles? I wrote earlier about that.. Why you should use them and now I was experiencing those benefits but also some other benefits!! If you let the trekkingpoles do their job.. And so get less burden on your leggs it will include that your arms will work a bit harder. If you use the trekkingspoles correctly they will unburden the legge and you’ll get a totall body workout. You will use your arms to pull yourself forward. You can do that easily but also with a bit more power in it. It is really good for your arms and several other muscles in that area!! How about the muscles in your chest? You give them a workout along the way! But also the muscles along your ribs. After a day walking I felt them… I didn’t use them appearently for a longer time. You use them when at the moment that you leg is going forward and you move your opposite arm backwards. 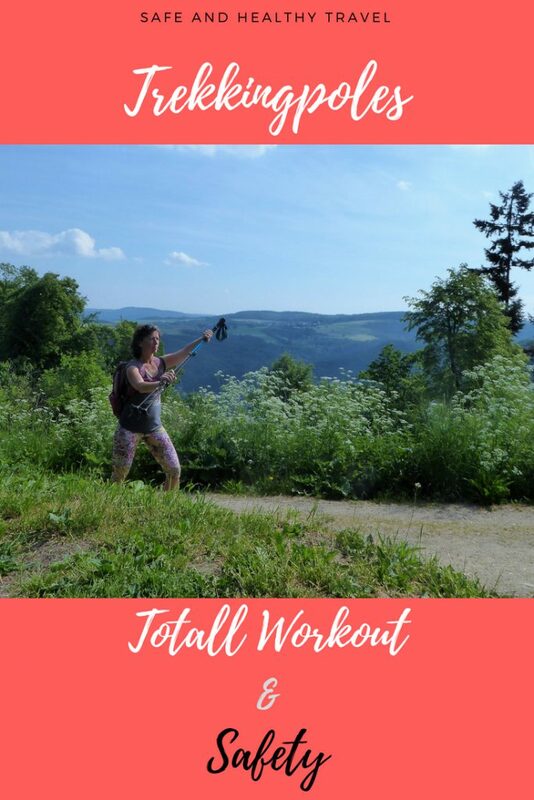 This to push yourself forward ofcourse to get into a great hiking tempo. Next to that this exercise is also good for your abs!! With every step you take you tighten your abs and so you train for a flatter stomach, who is in for that? In the meantime you are enjoying your surroundings, are active and also your are working on a healthier and better body!! As you can read, it is a totall body workout!! The second aspect I want to talk about is maybe even more important!! 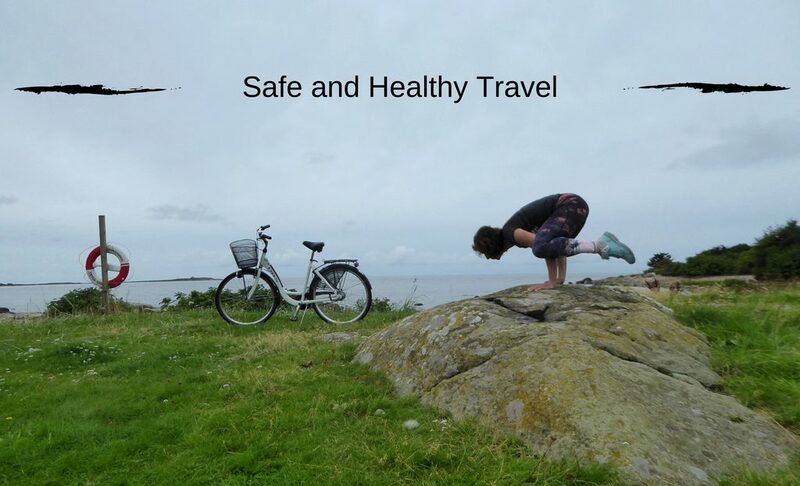 It is about the safety that you increase for yourself when you have your trekkingpoles with you. You will not be falling down as easily because you have more contact with the earth beneath you. 4 instead of 2 legs. But what about defending yourself when you are being attacked? Most of the time I hike alone. 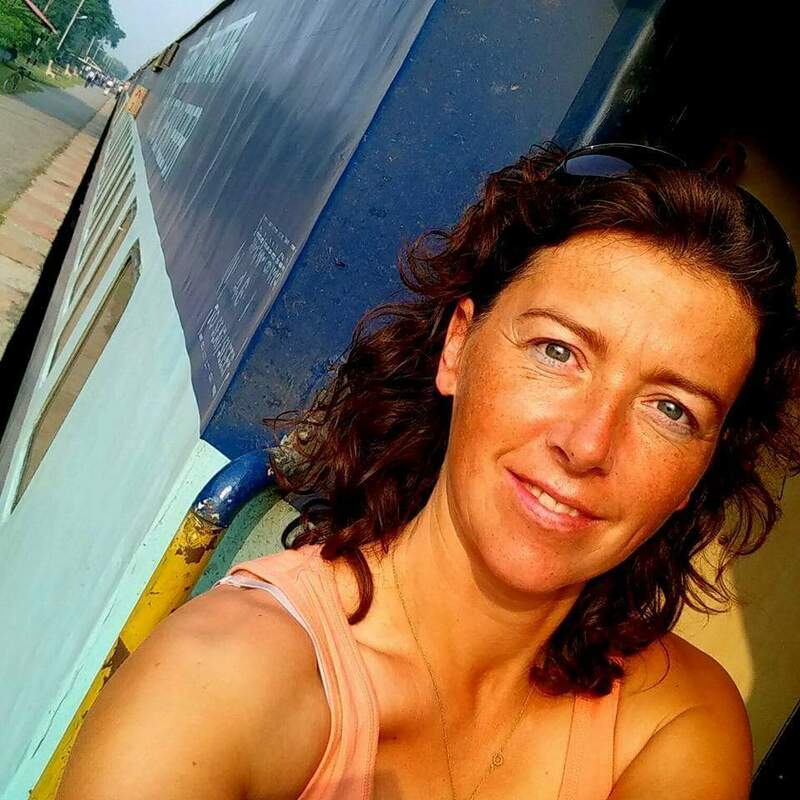 I do travel solo so if something happens along the way I need to defend myself. If you are being attacked and you are in an area where other persons are you need to get attention, scream, yell and act crazy so people will look at you and try te help you. But in nature it is diferent. Sometimes you’re hiking for several miles without even seeing a human being. The chances are small that you will see someone with bad intentions… But what if? With two long trekkingpoles you can defend yourself! You can use them to keep one on a distance. What would you do if someone is standing in front of you and pointing two trekkingpoles in your face? And not even mentioning that you can prick or slap with them! Yes! A totall workout & Safety! What if you are being attacked? You can defend yourself with your trekkingpoles. Keep both poles in one hand and keep your other hand on the bottomside of the poles. Keep them in diagonal in front of you. When you are holding them like this you can defend an attack to your upper body. To keep one away from you you can use the poles. Make a stabbing or pricking move towards your attacker. You can do this in different manners. You can do this with the side of your handbars but also with the bottom part of the pole. If you will punch that into someones abdomen it will hurt! I have some rubber tips on the bottom. Imagine if they are not on there.. You can really hurt your attacker with that. It is something you need to realise. You don’t want to hurt your attacker more then necessary. But if it is a serious attack and you need to fight for your life, you need to give the prove to your attacker that you mean business too! Most of the time I do have those tips on my trekkingpoles so the tip will not be that pointy but it will hurt if you give it a go. It will always be more hurtfull using them instead of the handbars. On the camino there was an incident. I wasn’t there.. I had blisters and didn’t want to stop because I was scared that I couldn’t stand up again. But my buddies did stop and they encounters the French couple. Have you ever thought about the trekkingpoles like this? that it will increase your safety while hiking? I hope it will be a reason for you to go and try the trekkingpoles!! This time a small carbine was still attached to my backpack. They come in so handy in all different ways! For now my trekkingspoles could be attached on them when I didn’t use them in the city. I used them on my Camino on a daily bases!! If you liked this post would you share it with others too? Want to read about some other hikes? 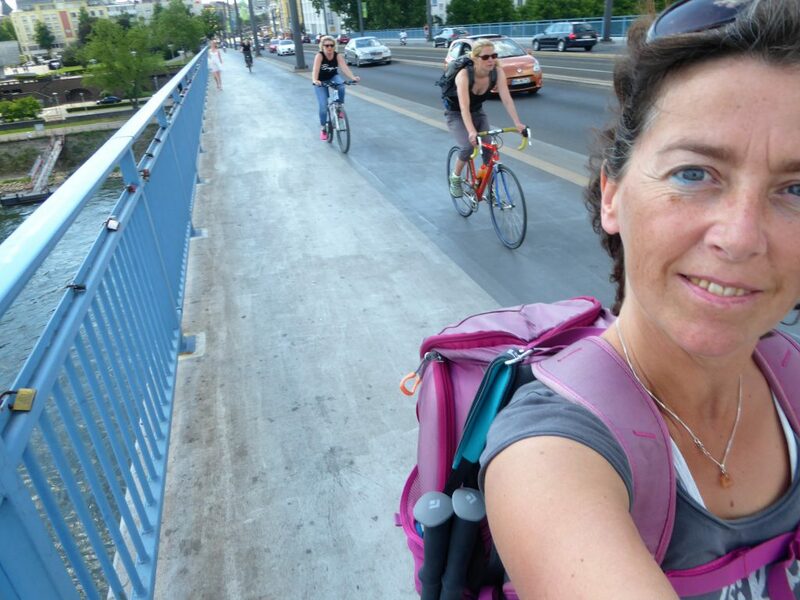 Or can I inspire you to go cycling? Thank you for your post. I gain a lot of information from your post. If I have a chance, I will get to Germany for sure. I believe that I will have numerous unforgettable memories. Thank you!! You must definitely try to come to Germany. It is a great country and has some great hiking trails!